There is no way to listen to rock and roll and not know Roy Orbison. His ultra cool pompadour-ed look, his odd performance posture, his amazing voice. The very fact that he was one of the Traveling Willburys alone proves the man was a classic rock and roller. A spectacular three-disc set, The Monument Singles Collection has just been released, featuring not only the man’s hit singles, like “Pretty Woman,” the spectacular paranoid “Running Scared,” his amazing vocal performances on both the heart-breaking “Crying” and “It’s Over” and the creepy “In Dreams.” Plenty of B-sides and a DVD of a nine song 1965 Holland Concert are also included. Disc 2, features the B-sides and is truly great stuff you’re probably not so familiar with (I wasn’t). There’s the liltingly sappy stringed “Pretty One’” with as strong an Orbison vocal as has ever been recorded; the groovin’ “Teardrops” (I love the piano in this one) and his tentative cover of “Love Hurts,” R.O. is literally howling on “Mean Woman Blues” and skirting some island sounds on “Leah,” and even a ultra slow version of “Beautiful Dreamer.” Most of these 19 tracks feature a heavy swatch of strings, less rock and roll stuff as the first disc, but all pretty spectacular, especially seeing as all the songs here have been restored to the original monaural sound first heard on their original 7” vinyl recordings. 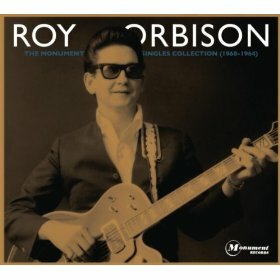 Roy Orbison enjoyed groundbreaking success on the Monument label from 1960-1964 and the output from those years is represented well on this three disc set.